Liam Fitzgerald is a special kid. Nine year old Liam was diagnosed with Down syndrome when he was born. He lives with his parents and his half-brother. He is huge fan of ice hockey, and a loyal follower of the Boston Bruins. So, what makes Liam a special child? Is it just the fact that he has Down syndrome, which makes him a child who deserves special care and attention? Is it how he cheers for his favourite team? Or, is it something else? When Liam was born in 2006, everyone was shocked to see him. He looked battered and bruised, like he had been in a fight. He was diagnosed with Down syndrome, a condition in which a person is born with an extra partial or full copy of chromosome 21, thus leading to delayed growth and development, as well as slow learning ability, and physical symptoms. A person with Down syndrome is born into this big bad world to face many difficulties. Liam, unaware of the difficult future that probably awaits him, has a uniquely lovable personality, despite his condition. When he first started smiling, he stole the hearts of his parents who were already happy to have him. He was quite a bundle of joy, a blessing to his family for them to love and cherish. His happy personality and contagious laughter make him quite special. As if the condition he was born with was not enough, fate handed him another challenge: cancer. At the tender age of three, Liam was diagnosed with Leukemia. The little boy with slight body and an infectious smile entered a four year treatment program. This meant that he would have to encounter aggressive chemotherapy. His parents watched helplessly as the little boy got poked and prodded with tubes and needles for his treatment. The little boy had no clue of what was going on with him, or why. All he knew is that it pained. This pain is what he remembers now, and that it felt ‘bad’. But he redefined bravery and toughness – he took deep breaths and focused during his treatment process every time, and made his father much prouder than he already was. Finally, when he was only 7 years old, Liam took his last dose of chemo. 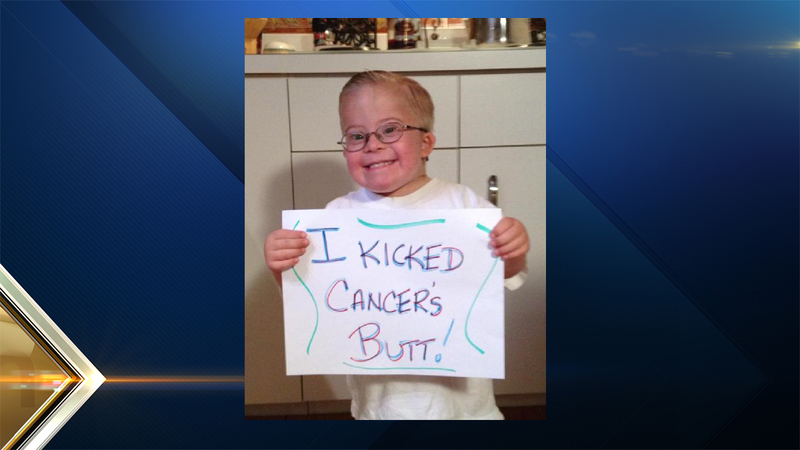 Little Liam defeated cancer, with a wide grin on his face, and proved himself to be special again! Having regained his strength, there was new development in Liam’s life: he started showing great interest for ice hockey, something which everyone assumed had come from his sports-loving half-brother. Suddenly, his life started revolving around hockey – playing with his father and brother, owning his own little kit, complete with a net, watching matches, dressing up to look like a hockey player. Something about the energy and action keeps Liam engaged to the sport. Down’s syndrome is associated with slowness and delay of growth, development, and other aspects. It’s ironical that Liam fell in love with something that is completely action-packed. And, that makes him a sports lover of a special kind. Ice hockey was in Liam’s life and imagination, and for Halloween 2013, he wanted to live his imagination and dress up as a hockey player. And not just any player – he had someone special in mind. Liam is a huge Boston Bruins fan, and his favourite player is Adam McQuaid. The Bruins defenseman had an average lower than two goals per season. That year, he had injured himself. In fact, he was not considered much a star in the world of sports. So, when McQuaid’s sister noticed Liam’s Halloween photo on social media, and showed it to McQuaid, the player was left astounded to see how this child idolized him. To every entertainer, the love of fans is very important, and Liam gave his favourite star what he needed – a special fan! Liam had stolen McQuaid’s heart, and he decided that he had to meet his little fan. So, later that season, the Bruins arranged for their greatest fan to attend a match. At the end of this match, Liam found one of the happiest moments in his little life, as he was named the fan of the game. That was not the end of it for Liam. After the match, he got the chance to meet his hero, Adam McQuaid, who was quite surprised to see how comfortable the little boy was in front of him. When Liam is asked about his feelings for McQuaid, the laconic yet expressive boy just uses one word – “happy”. To bring the best out of people and make them do something special for someone, it takes a special person, like Liam, who established a special bond with the Bruins. In November 2014, Liam was at a Bruins match, early enough to try and get a high five or a fist bump from the players at the tunnel. He kept blowing kisses when he saw himself on the Jumbotron. Liam, a regular at Bruins matches, was recognized by the director of PR, who helped him move to the bench for a better view. And, throughout the match, he sat, his fist out, and every player fist-bumping him. 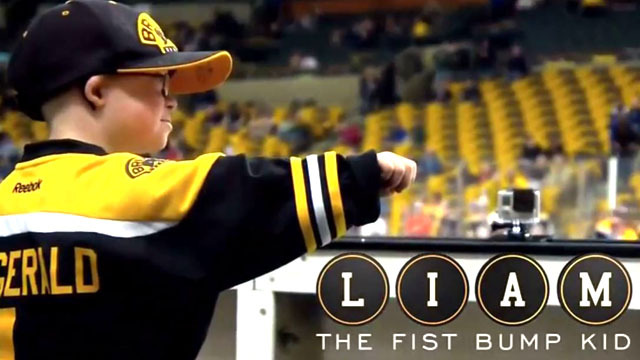 The next day, his mother found a video on the internet, which had captured the moment of the Bruins fist-bumping Liam. The video, with a cuteness overload, and his reaction when Gregory Campbell struck his tender fist a little too hard, had received over five million views in a day! The Fist Bump Kid was thus born, and he became an instant celebrity, with a special star quality. 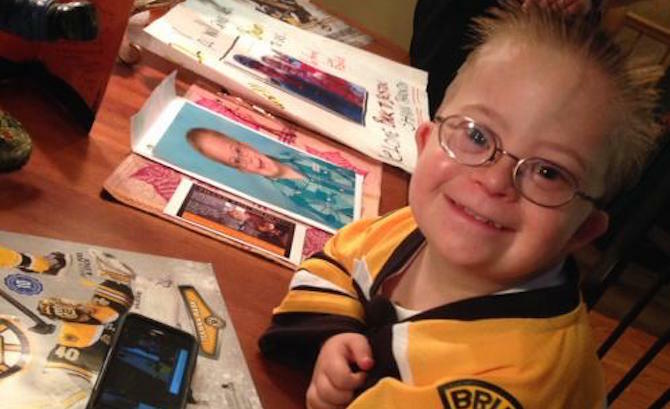 Three weeks later, a happy Liam was on his way to the Garden for another Bruins match. He sat there at the bench again, interacting with the players and every one of them – everyone except Campbell, of course, lest he hit Liam hard, again. 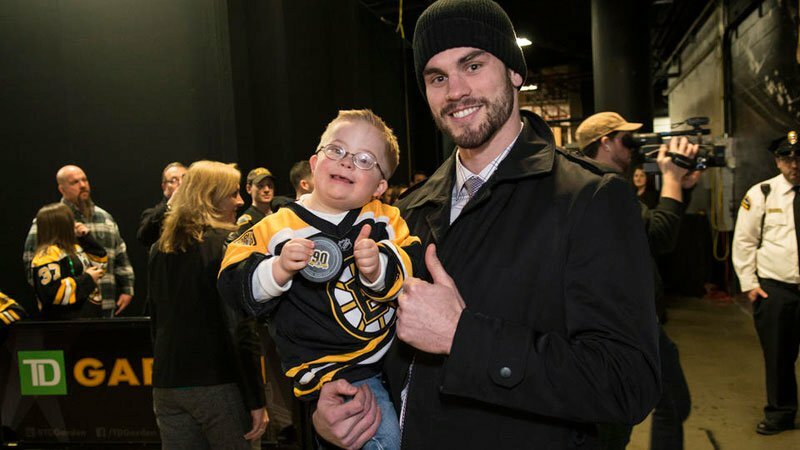 Once the game was over, Liam got to have one of the biggest moments of his life – he met the Bruins, hugged them, and even fist-bumped Campbell with all the power his tiny fist could muster. He then hugged his favourite, McQuaid, and gifted him a card, wishing him good health and quick return. Liam even wrote on his cast of plaster. The Bruins felt the same love that McQuaid did. It warmed their hearts to see such an enthusiastic fan. Little Liam sowed them a pure and innocent kind of love, rising from his special little heart. 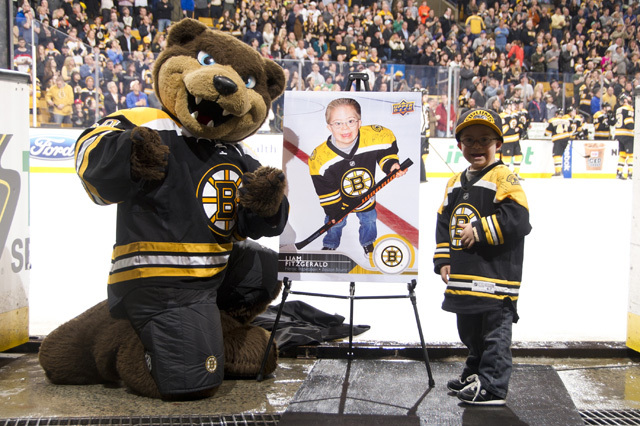 Liam received great love from everyone associated with the Bruins, and to make the whole ordeal even more special for him, he was given a unique gift. Every sports fan has the hobby of collecting playing cards, with the statistics and other details of their favourite players on these cards. Trading cards have been seen to turn into memorabilia. To mark Liam’s adorable presence in the world of ice hockey, he was given his very own Upper Deck Hockey Card! To have a big dream, and to live it, to have others turn it into reality – that’s what makes Liam more special. Liam is quite a star in his own right and imagination. Everyone associated with the Bruins knows him, and he has his own way of handling the recognition he gets. He has a remarkable level of ease with which he talks to head coach Claude Julien, blows kisses at the Jumbotron, or raises his hat in response to the claps and cheers he receives from people who recognize him immediately. He even put his fame to good use, by starting a fundraiser to help cancer patients. In 2015, the Fist Bump Kid had a new recognition: he won Leukemia & Lymphoma Society’s Man of the Year title, and or the campaign, he helped raise $152,000 for cancer research. What could make him more special? Little Liam, the fist bump kid, is a fighter who beat cancer, and he smiles through the hardships that his condition entails. He has a spirit of true sportsmanship burning within him, and has kindled the same spirit in those lives he has touched. He has humbled celebrities. He has he derived joy that sports is known to bring, and has given it back, especially to the players. He has reminded everyone how sports are about fighting till the last moment, about sharing and caring, about happiness and passion. He has a beautiful imagination, and lives it thoroughly. He has brought the best out of everyone around him. Neither fame nor struggle has been able to wipe out his smile, or alter the pleasing personality, because he has not let either change him in any way. He has seen his dream become real with his personality, and used his recognition to help others in their battles – all in this little life.